As summer winds down and the school year starts, your life likely just got a whole lot busier. Whether you have kids lunches to pack, extra-curriculars to keep up with, or maybe a new busy season has begun at work, this time of year can often bring extra stress along with it. It might be difficult to think of relaxation now, especially after you’ve just gotten back from a week at the beach. However, research shows that relaxation can be an important part of your daily routine – making stress more manageable and even offering pain relieving benefits. We’re here to help remind you of the importance of relaxing, and even better, how you can do it – even when you think you can’t. Stress is something we try to avoid, but often can’t. Stress can have some serious detriments to your health – both mentally and physically. Physically, stress can increase your blood pressure and put your heart through extra, unnecessary work. This can lead to an increased risk of heart attack and stroke. Stress can be as dangerous as hypertension, a poor diet and lack of exercise to your heart. Stress has also been linked to depression, it can even kill brain cells. So, without stress, your body is healthier, even showing it can better fight off colds and slow cancers; and your mind is healthier by improving your memory and staving off depression. If this hasn’t convinced you to decrease stress through relaxation, don’t worry, we have plenty more reasons to share why relaxation is important to your health. The benefits of relaxation can extend to improved chronic pain management, as well. For those of you suffering from back pain, relaxation can be a healthy, holistic way to find relief. Relaxation eases your body and relieves muscle tension. It can also help take away your focus from the pain, giving you a break from using energy thinking about and managing the pain. Stress can cause you to feel tense – usually because your muscles involuntarily tense up under stress. This tension can cause pain. Relieving stress can release the muscle tension making you feel better overall. Finding ways and the time to relax might not always be your priority – but, these easy tips can help you carve out just a few minutes to relax your mind and body. 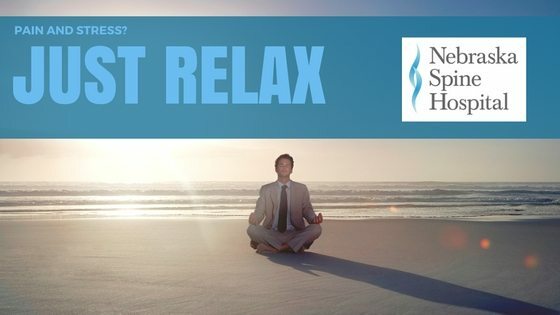 You only need a few minutes to try these relaxation techniques, but those few minutes will have your back thanking your for much longer. If you are tight on time, the best technique is slow, calculated breathing. You can focus on your breaths or even place your hand on your belly to feel the breaths go in and out. Breath in deeply and hold for a 3 count. Exhale deeply for 3 counts. While breathing, you many find it helpful to thoughtfully recite a mantra such as “I feel” on your intake and “relaxing” on the outtake. During your deep breathing sessions, you can add in guided imagery. You can imagine yourself in your favorite place, or a peaceful setting. Take 5 or 10 minutes to explore the setting. What does it look like? Smell like? Feel like? Make sure you feel safe and comfortable in this space and feel yourself relax. You might even find implementing Progressive Muscle Relaxation can help change the focus from painful tension in your back to relieving tension elsewhere. PMR is a technique in which you will voluntarily tense and then relax different muscle groups. You might start with tightening your toes, your calf or your thighs. After each sequence of tensing, you will release the tension and feel the stress slip away from that muscle. The benefits of relaxation are important for our fast-paced, stress-filled world. If you are experiencing pain, it can be even more important to help you get through your day. The best part about relaxation is that it can be done anytime, anywhere and only takes a minute or two. Those few precious minutes can help lower your blood pressure, take away back pain and give you a clearer head to take on your day!